Between tyrannical, derailed, supportive-disloyal, or constructive, which one represents you as a leader? Einarsen, Aasland & Skogstad in their article Destructive Leadership Behaviour: A Definition and Conceptual Model, define the destructive leadership behaviour as following: “The systematic and repeated behaviour by a leader, supervisor or manager, that violates the legitimate interest of the organisation by undermining and/or sabotaging the organisation’s goals, tasks, resources, and effectiveness and/or the motivation, well-being or job satisfaction of subordinates” (2007, p.2). Einarsen, Aasland & Skogstad set two dimensions in leadership: (a) the organization and (b) the subordinates. A leader’s behaviour may be positive or negative to each of these dimensions, and this is has been visualized as two dimensions intersect and correlate. 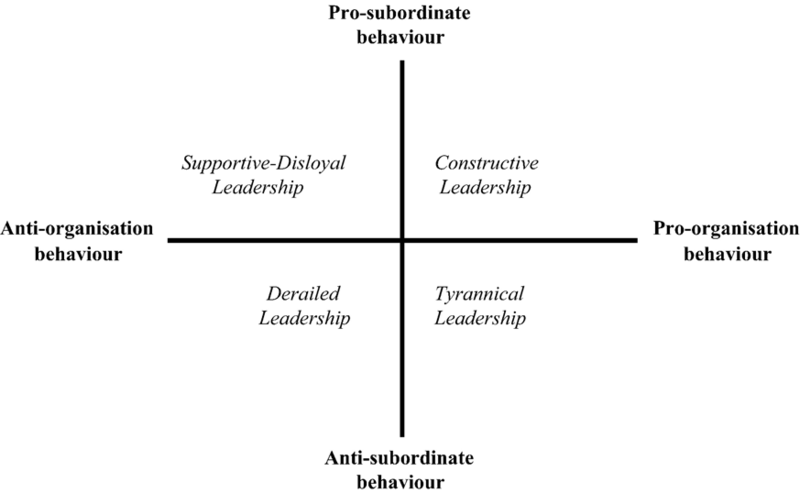 According to the figure above, there are three types of destructive leadership behaviours: (a) the tyrannical, (b) the derailed and (c) the supportive-disloyal, and the constructive one. Tyrannical leaders are those who pose an anti-subordinate behaviour from one hand and a pro-organisation behaviour on the other. This means that a tyrannic leader may undermine the well-being, the motivation and the job satisfaction of subordinates, but may behave in a way that fulfil the goals and strategies of the organization. This is what Ma, Karri & Chittipeddi (2004) call “the paradox of managerial tyranny”. In the next quarter of the above scheme, we find the derailed leaders, who display a negative behaviour both towards their subordinates and their company. These leaders intimidate and bully subordinates, but they also fail to adopt in order to remain successful, thus they are unable to fulfil organizational goals. In the above quarter, of the derailed leader, is the supportive-disloyal leader, who care about their subordinates, but they violate the interests of the organization. In the last quarter we find the leaders who care both for their subordinates and their organization. These are the constructive leaders, who act towards the interests, goals, strategy and vision of the organization, utilizing organizational resources in the best way, and in the same time they enhance the well-being, motivation and job satisfaction of their subordinates. Effective leadership is essential for the present and future of every organization, but, surprising enough, effective leader is not only the constructive, charismatic leader. Because among to the charismatic leaders, who can realize the desired outcomes, tyrannic leaders can also lead the vision and reach organizational goals. As Ma, Karri & Chittipeddi say: “the best leadership style is the one that produces the desired results” (2004, p.40). Very interesting reading – and takes me back to my MBA days! Too many people at the top of organisation are not leaders, but just managers. Interesting in the world of free and open software, and education, that leaders are coming from ‘techies’, rather than management, and I think that has a large effect, not always positive, in terms of the project growth? Leaders VS Managers… you put it very well Stuart. Seeing things from an employees perspective I would say that it’s inspiring working with leaders. But working with Managers can be demotivating, or even destructive. Effective Managers may force employees to do the extra mile, while leaders will just inspire them to do it.